The Texas A&M Soccer camp Store is available during all sessions. The store has T-shirts, jerseys, sweatshirts, caps, balls, and other Texas A&M Soccer items that are only available in this store. The Camp store will have snacks available. Pizzas can be pre-ordered each day for a delivery after the evening session. This year at soccer camp we will once again offer a “camp bank." The Camp bank is a courtesy offered to allow campers to have funds available to spend in the camp store without having to worry about cash handing (There is a $5.00 set-up fee). A Camp Bank Limit can be established prior to camp. As the camper makes purchases in the camp store (candy, drinks, snacks, t-shirts, pizzas, etc.) we will keep track of their expenses and we will NOT let them spend more than the limit set by their parents. At the end of the camp week, we will total up the charges and we will charge the account ONLY for the amount spent. A list of purchases made by your camper can be requested by emailing the soccer camp (soccercamp@athletics.tamu.edu). Setting up the camp bank will be done completely online. We have partnered with the Active Network to handle the processing of the camp bank. Special Aggie Soccer Camp "Cool Rag"
This Texas A&M Soccer Scarf is now available for Soccer Campers. This scarf was designed to resemble the Aggies official Maroon jersey - You may purchase through the registration system. The scarf will be mailed directly to your home. 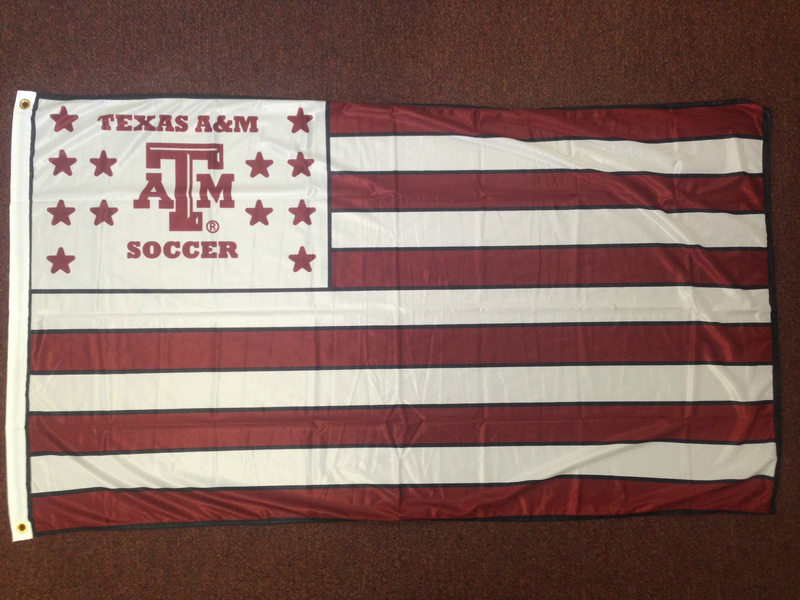 The Texas A&M SoccerFlag is now available for Soccer Campers. You may purchase yours through the regsitration system. The Flag will be mailed directly to your home. You may return the item for a refund if the item still has tags and has not been washed.